V‑Vocal is a vocal processor that does pitch correction on notes and phrases, corrects timing, edits formants and dynamics, and can add vibrato. 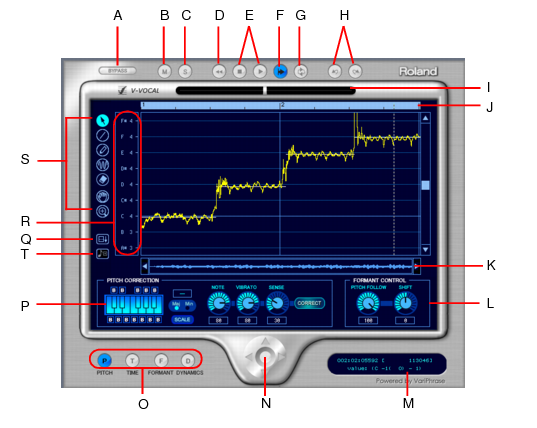 The following topics describe using the V‑Vocal interface to process audio data. For information about inserting and managing V‑Vocal in Cakewalk, see V-Vocal Region FX clips. Edit mode. Select the parameter you want to edit: pitch, time, formant, or dynamics. Zoom. Continuous horizontal or vertical zooming by dragging the center vertically or horizontally. If you drag the center while pressing the SHIFT key, you can restrict the zoom direction to horizontal or vertical. Zoom in or out incrementally by clicking any of the four arrows. Double-clicking the center shows the overall clip. AutoScroll. The editing display scrolls when you turn on AutoScroll. Formant control. The Pitch Follow knob increases or decreases the formant according to pitch. The Shift knob increases or decreases the formant for the entire phrase. Keyboard and Scale buttons. Assign the target notes with the Keyboard button; each key has a Bypass button (B) located under or over the key. The Scale button lets you assign the target notes by scale: click the Scale button, click Maj or Min, and click a note on the Keyboard button to choose the root of the scale. Note button. Use this button to set the rate of pitch correction. This function can adjust the pitch to the selected notes’ grids by increasing or decreasing the pitch of the selected region. Vibrato. Set the depth of the vibrato. If you choose 100%, vibrato depth is set to zero. Sense. This is a sensitivity control for pitch correction for unstable pitch areas such as portamento. Pitch correction gets stronger if you increase the value. Cent indicator. This indicator shows the pitch correction amount by cents in realtime (+/- 100 cents). Timeline. This gives a graphical display of the playback time in beats. Arrow tool . For selecting the editing region, and for increasing or decreasing the pitch of the selected region. Line tool . For drawing Pitch, Formant, and Dynamics with straight lines. Pen tool . For drawing Pitch, Formant, and Dynamics freehand. Vibrato/LFO tool . For adding and editing Vibrato or LFO at the selected region. Eraser . For resetting the selected region to its initial value. Hand tool . For scrolling the display. If you drag in the editing area while pressing the CTRL key, you can zoom. Rectangle zoom . For selecting an area to zoom in to. Drag a border around the area you want to zoom to. Overall area is displayed by double clicking.